The neo-classicism was born thanks to a series of circumstances. It is the moment of rediscovery of the Classical Antiquity. In addition to this, the state created the academies to convert the classicism into rule. Last, but not least, the Baroque forms were exhausted. The Neo-classical architecture is going to recover the styles of the Antiquity. Its moment of maximum splendour reached at the beginning of the 19th century and the art is becoming full of more and more superficial forms. · Size can be colossal, with a special taste for pomposity and decorated with rich materials. · The evolution covers all the Ancient styles, beginning with Greek, Rome, Paleo-christianism and Renaissance. · The classical trends are present in architects who prefer the measured form to the felt one and use a language of stereo-metrical basic forms, with cubes, spheres, cylinders and pyramids. All the volume s are massive. · The most used order is the Doric, with fluted shaft; the column recovers it old importance and the pediments appear everywhere. 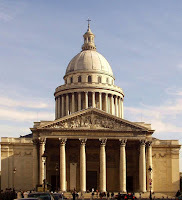 · From Rome they take the conception of space, with special interest in domes. The interior of the buildings tends to have a very ordered plan while in the exterior big volumes are dominant. · They prefer to copy than to innovate and the buildings must give the sensation of order and authority that the monarchy aimed at transmitting. · The new thing is the adaptation of the Greek temple to the Christian religion. Famous architects are Soufflot in France and Wren in England. During the second half of the 18th century there is a special effort to depurate and simplify the architectonical shapes. This job was directed by the academies, being the most important that of San Fernando. · Ventura Rodriguez: he worked with a marked eclecticism. · Sabatini: classicist forms consolidated with him. · Juan de Villanueva: He is the only Spanish architect related to the architecture of the reason. Among other works he realised the Prado Museum, in which he combined the use of stone and brick, concealing the classical monumentality, the modernity of his time and the functionality of his work. His style continued during the first half of the 19th century.